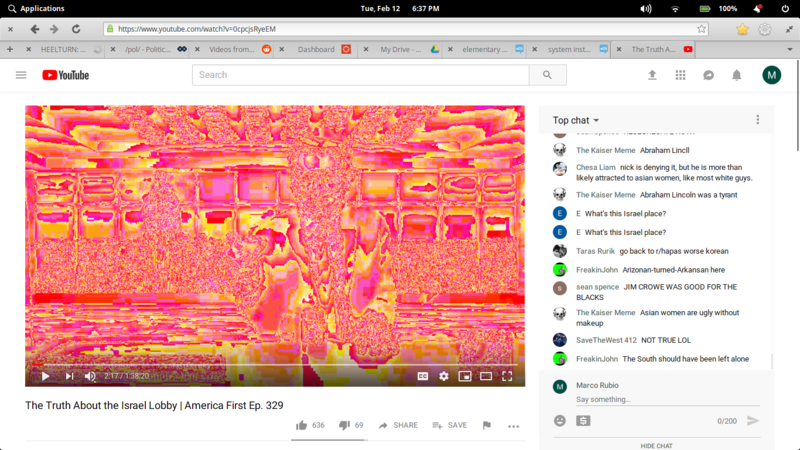 I am getting some extravagant 'infrared-camera-looking' artifacts both on a Youtube livestream and also when I try to play an H.264 coded video in elementary Videos. I tried installing many codec packages including ubuntu-restricted-extras, ffmpeg codecs, and others, with the same result. This is a fresh install of the stable ISO barring the flurry of packages I tried. There is no issue with opening the container, playing the sound, with no errors, but the video feed is no good. Firefox and mpv work fine, but I want to use the stock OS if I can. It's an issue with AMD cards, from what I know it's not fixable by the user. You can install "gnome mpv" to view videos since it doesn't have this problem unlike the default video app and looks just as good. As for epiphany, it's the same thing unfortunately. Not the answer you're looking for? Browse other questions tagged display release-juno graphic-drivers graphics or ask your own question.